Coming out today to celebrate Halloween is I.E. 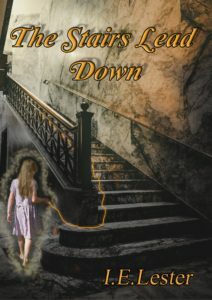 Lester’s debut YA ghost novel, The Stairs Lead Down, a novel to read under the covers while ignoring Trick or Treaters. What could be worse than moving from London to the middle of nowhere, at the age of 13? New school, new place, new people and a ghost in the kitchen! Lizzie and Noah discover a portal to the ghost realm and take the Stairs Down to end up in an adventure of a lifetime. Will the help of two mysterious women – Elizabeth and Magda be enough for them to face the Evil which wouldn’t hesitate to kill? What if this Evil wears the face of someone they have trusted their entire lives? The first author I found whose writing excited me was Isaac Asimov. I was nine years old and on a typical English summer holiday; i.e. sheltering from the rain wherever I could. I found a book with a wonderful cover in a small kiosk store, and for some reason I cannot remember picked it up. What I read on the back fascinated me and I had to buy it. I was very glad that much of the rest of the holiday was as just wet for I had finished the book before we went home. From that moment on I was hooked on Asimov and then on science fiction in general. Horror and fantasy came a few years later. My tastes have changed over the years. Although I do still read science fiction and horror, with Stephen King, Robert Charles Wilson’s and Kevin J. Anderson’s books never missed, I have expanded to include some more literary and surreal authors albeit with mostly ones with speculative elements. I would count Zoran Živković, Magnus Mills and Max Barry as particular favourites these days, and I find the wait between releases intolerable. Živković writes darkly whimsical, impossible stories, often with Kafkaesque overtones. His stories are wonderfully European. Not that I have anything against fiction from North America; King, Wilson and Anderson above attest to that. But being a European it is good to read fiction influenced by a different culture. With Magnus Mills it is his very plain, wonderful effective prose I adore. Oh, and the ordinariness of his plots. He’s written stories about workers building wire fences, driving buses or vans, and people camping in fields. Yet in every story he’s managed to tell there is a strong allegorical element. He seems to always taking a historical event or period or a philosophical, political or social situation and breaking it down into its most simplistic form and retelling that story in a bland setting that is much more layered than you might immediately believe. Max Barry writes surreal fiction although with a hefty dose of satire. His stories take aim at government, big business (repeatedly) and elitism. It might help that my personal politics are liberal and I appreciate the sentiment. He just doesn’t write enough novels for my liking. It’s usually four years or so between releases. I have written a novel that I would say was influenced by these three authors; more Mills/Barry than Živković to be exact. It’s a story of higher echelons of the largest multi-national to ever exist becoming further and further detached from the real world and reality. I haven’t dared send this out yet, fearing it might be too close. One day I might re-read it and judge whether it is mine enough to share with the world. It was wonderfully cathartic to write though. I’ve just finished reading Emily St. John Mandel’s Station Eleven. I would recommend it to anyone who enjoys literary fiction, science fiction or otherwise. In fact I have been doing that since I finished it at the weekend. It’s set in an immediate future which has seen a plague kill the vast majority of humanity and follows a handful of people in the Great Lakes area linked by an actor who died in the opening scene. But unlike a lot of post-apocalyptic stories (and I have read many), it doesn’t have the kind of good vs evil overarching plot or the desperate struggle to survive in a collapsed world I’ve come to expect in these stories. Station Eleven is a much more gentle story than that. It tells the story of survivors, of their lives in the new world. It’s a wonderful study of human character. I have to read everything else the author has written. She’s brilliant. Does locking yourself in a room for hour after hour, day in day out hitting keys on the keyboard rather than going out socializing count as a weird writing habit? Aside from being flippant I do have some necessary writing habits. I write listening to music. I can’t not have music playing. If I try without every single noise distracts me and I need to go find out what is causing each and every one. Put music on, and it drowns everything else out, and then I can write. And it’s not as though I block out the music. I usually have my foot tapping along. I often sing the lyrics as I’m writing (my wife would dispute the use of the word singing here though), and they don’t seem to confuse my writing flow. I can’t do it with the radio though and definitely not with TV or films. If people are talking, I listen. If they are singing, somehow it works. As for how I write I’m much closer to a plotter than a pantser. I need to know where I’m going before I start. I keep piles of notebooks into which I scribble down the ideas for a story; a general plot, subplot points, characters, details of the setting, even fully handwritten scenes to use later. Once I have enough in here to get from A to B, through to Q or wherever it ends up, I’ll timeline it and then start writing. Most of the time it keeps to the basic plot, but I like to allow my characters their head a little. If they don’t like going exactly where I’d initially intended them, I will always listen to their needs and accommodate them as much as I can. It’s harder when the plot spans several possible books as too much detouring from the basic plot makes the end harder to reach. In these cases I try to keep things on a much tighter leash. The Stairs Lead Down is a young adult supernatural novel set in my adopted hometown, Ashby de la Zouch. It’s in Leicestershire in the middle of England for anyone who doesn’t know, which I’m sure includes most of the population of the rest of England. It features two twins, Lizzie and Noah, who, thanks to a weird fluke of their birth, have the ability to see into the ghost realms through portals fixed in place by violent deaths. Through these they can encounter the ghosts of the men and women killed to cause the portals to form. Unfortunately for them there are people in the world who want to use the ghost realms, and those darker places that lie even further out from our reality, for their own dark purposes and see Lizzie and Noah as a means to achieving this. I am going to admit one huge influence on my stories now. Twenty years ago, like a lot of people, I watched Buffy the Vampire Slayer. From that moment on I like the idea of a strong female character being the hero of a story; especially if that character does not look like she should be capable of fulfilling that role. A second influence has to be David Eddings’ Belgariad series. Although the lead character here is male, he is of a similar age and totally unaware of the power he has. He grows up through the books and comes to accept his unenviable destiny. I wanted to include something of that in my story. Hopefully it comes through without making Lizzie too annoying. My test readers didn’t seem to think so. Lizzie is fourteen in the novel and small for her age. She would not be most people’s idea of who to send up against a powerful necromancer but, in a world of powers, why should physicality be important? 5. Titles have always been extremely difficult for me. How do you come up with yours? Titles, for me, help bring the story into focus. I have always had the title fixed before writing the first word of the story proper. They can chance during my notebook phase. One or more of the notebooks have one or two crossed out titles, being replaced with something I find more appealing. My wife has mentioned once or twice that I don’t seem to settle down on a book until I’ve made my title obscure and opaque enough, but I’m not sure I agree. They usually relate to an aspect of the story that, to me at least, is the crux of the idea. One of my first attempts at writing a novel, and the second I actually got to write “The End” for, was called the Day before Tomorrow. Given it’s a story in which time doesn’t pass in the normal sense I felt it apt. “One of your titles” was my wife’s verdict. I was raised more on titles like “the End of Eternity” or “Childhood’s End” than “the Thing” so I prefer titles that promise something. The Stairs Lead Down is one of my most obvious titles. Its sequel, currently in progress, is called Breath of Imagined Dead. I do have other books. I have finished, at least to first draft, eleven novels/novellas covering both adult and young adult fiction: horror, science fiction, fantasy, satire and weird genres. I have a series of weird novellas featuring a middle-aged, middle-class, middle-Englander called Ben Williamson. I created this character to be an everyman. He’s the person you would sit next to on the train without noticing, the man you wouldn’t remember meeting before. Because it might annoy a former colleague of mine, I made him an accountant. I basically took my own personality and presence then stripped away everything that would make him (me) stick out in a crowd and replaced these elements with Mr. Average. I’m 6’8”, far too tall, so I made Ben 5’11”. I have no children, uncommon, so he has one. My musical taste can get a little oddball (Tom Waits, King Crimson); Ben likes Fleetwood Mac and AOR. So having set up a bland character living a bland life I then torment him in odd ways. 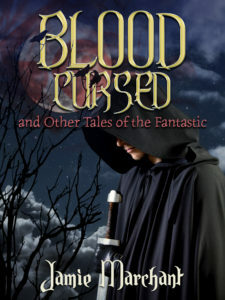 I have a ya fantasy series; book one of which I rewrote over the summer at the request of a London based publisher. They are currently reviewing the rewrite; something which is making me quite nervous. I did warn my wife I might become intolerable while I wait. There are two horror novels, one set in the town where I grew up and mostly populated by versions of my childhood friends although the demon is a total invention, and the other set in a version of the village where I live now. I enjoy writing horror. 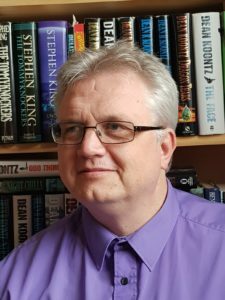 If you’ve had a bad day, coming home to imagine graphic violence being inflicted on people is a wonderful stress release, but unfortunately the feedback I’ve had from agents/publishers tells me horror from new authors isn’t selling so I have put my personal feelings aside and am concentrating on other genres. It’s not a great hardship. I enjoy writing these also. And then there are the others; a bawdy space opera detective noir story, two surreal satire novels parodying some of the worst aspects of our culture and society, and an alternate history story set in a world where the US didn’t break away from the British Empire and Britain controls the world, albeit with some cracks in this dominance starting to appear. This last book has the title I like most of all my stories, Against the Fall of Empire. The current work in progress is the sequel to the Stairs Lead Down. I’ve written the first three chapters of it and will be working on its first draft for the next couple of months. After that who knows? I have about forty notebooks each partly filled with story ideas. I scribble in these when a detail pops into my head that could help flesh a plot out or make a character seem more rounded. I read through these periodically, hoping all the time I can figure out my own handwriting, to determine whether one shouts loudly enough to me that I can resist writing it no longer. Venice for an entire year. I would love to see the city in every light; see how it changes as the seasons progress. I’ve been to the city multiple times, seeing it in Spring, Summer, Autumn and Winter but always for too short a period; not long enough to see how one merges into the next. Venice I feel is the one place on Earth that inspires me. And this works for science fiction, fantasy and horror. It has elements of all of these genres. No place on Earth is like Venice. It is totally detached from life anywhere else. One of the stories I want to tell is a fantasy retelling of the early days of the Venetian Ghetto. I have the characters. I have the story. I have the feel. I just need to have it shout loudest. Maybe one more trip to Venice and I won’t be able to resist. My first thoughts when I read this were of the Italian Renaissance or the Age of Enlightenment. I then consider the Industrial Revolution in England in the late 18th and early 19th centuries. Each of these periods saw an explosion or new ideas. But in truth I would pick no time in the past. For one thing I like my creature comforts. Much as though witnessing the great masterpieces of Leonardo or Michelangelo being first unveiled, being in the presence of some of our species’ greatest thinkers (Adam Smith, Voltaire, Immanuel Kant, Jean-Jacques Rousseau, David Hume, and so many others), or seeing the great engineering feats of the Victorians I am a man of my time. Thinking about the future is fascinating. Who wouldn’t want to see what humanity makes of itself in the next hundred or thousand years? Presuming of course we managed to grow up as a species, stop trying to come up with new ways of killing each other and start taking better care of our planet. But the idea of moving forward in time to meet future generations is terrifying. I would no more understand the world of a hundred years from now than a man of 1500 would understand our modern world with its ready meals, internet trolls, reality TV and celebrity worship. I pick these comparisons, one hundred years forward to five hundred back, deliberately. The world is changing at a faster and faster pace. I cannot see this slowing, not unless we kick ourselves back to the Stone Age through acting irresponsibly. I am a man of 2017. I am comfortable in 2017. I choose to stay in 2017. Lizzie picked up her iPhone to check the time. It was two thirty. She’d woken up half an hour ago and couldn’t sleep. She felt restless and edgy and lying here in the dark wasn’t helping. All she was doing was stressing herself out over every sound and checking the time every two minutes. What could she do to make herself relax and feel sleepy? Maybe a drink would help. It couldn’t hurt. She pulled the duvet back and swung her legs out of bed. Her feet found her slippers exactly where she’d left them. She never put slippers on in midsummer back in their old house. But back there the ground floor wasn’t entirely stone floored. 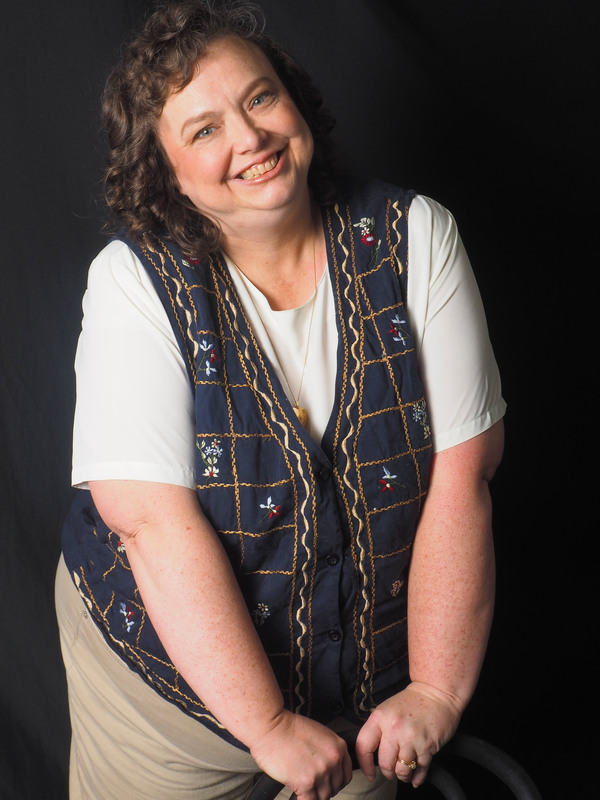 She pulled the dressing gown around her shoulders and tiptoed across the floor. She hoped she would remember every creaky floorboard between here and the top of the stairs. The last thing she wanted was to wake up Mum and Dad. She eased the door opened, just enough to allow to slip through albeit sideways, stopping it short of the point where its hinges would complain. Once clear of the door she turned to make her way towards the stairs. She wasn’t alone. There was someone there with her. Was there a burglar? She was terrified. She opened her mouth to scream. Just in time Noah clicked on the torch on his phone, focusing the light on his face so she knew who it was. He was holding a finger in front of his mouth suggesting quiet. He turned away and gingerly made his way across the landing. She recognised the awkward pattern of his stepping. So she’d not been the only one to learn which floorboard creak and which ones don’t. She took note of where he put his feet. Would she be able to match his steps? She doubted it. He had much longer legs. She’d have to rely on her own safe passage; if she could remember where to tread. The two of them reached the stairs without disturbing their parents. Through their door she could hear the familiar synchronised snoring. She realised she hadn’t heard it in the last month. Maybe there was one advantage to being in this house rather than their previous. The walls were thicker and blocked out sounds their old house allowed through. Noah was already half way down the stairs. He wasn’t having to be careful here. The stairs were part of the original house before the modifications. Each step was solid stone. She rushed to keep up with her brother. He was standing at the foot of the stairs eerily illuminated by phone light. He looked weird; like he was in one of those old black and white movies. When she reached the stone floor of the entrance hall he turned the light off. There was enough moonlight coming through the windows either side of the front door for them to be able to see and when they reached the kitchen they could put the light on. Lizzie stepped passed her brother and started towards the kitchen. That’s when she saw him. On the platform where the now dead Mother-in-Law’s Tongue had been until this afternoon was a boy about their age, maybe a little younger. Unlike earlier when Noah had stopped her at the last moment, this time she screamed; and louder than she ever had in her life. Noah gasped, startled by her scream. His cell phone fell to the floor, the screen shattering on the stone. He turned his head to where Lizzie was staring. He saw the boy. His reaction was immediate. He jumped in front of his sister, getting his considerable frame between her and the mysterious boy. Behind him Lizzie screamed again. Upstairs she saw their parents light switch on. Yellow light illuminated the stairs behind her. For a second it caught her eye. She quickly turned her gaze back to the dead end stairs. No one was there. Her mother appeared at the top of the stairs. She cried something down. Noah never heard the words. He looked up briefly to see her and Dad rushing down the stairs. He turned back to the blocked stairs and the boy was gone. How could that be? There was nowhere for him to go. He stepped forward and hit his hand on the walls all around the stairs. The boy had vanished. But where? I.E. “Edmund” Lester is a lifelong fan of science fiction and horror. A school trip to a Jacobean Mansion complete with spooky tales of ghostly inhabitants launched a fascination with supernatural horror, although not a belief in the reality (he is still a strong skeptic). A washed-out family holiday confirmed his fate when the cover of an Isaac Asimov collection attracted a nine-year-old eye. He has spent the subsequent three decades amassing a large library featuring the works of King, Bradbury, Heinlein, Clarke, Lovecraft, Poe and many, many others. After many years content with being a dedicated reader, Lester finally tried his hand at writing. After dozens of reviews, articles and short stories he has now decided to concentrate on longer forms. His first novel, the Stairs Lead Down, a young adult supernatural story, is released Hallowe’en 2017.